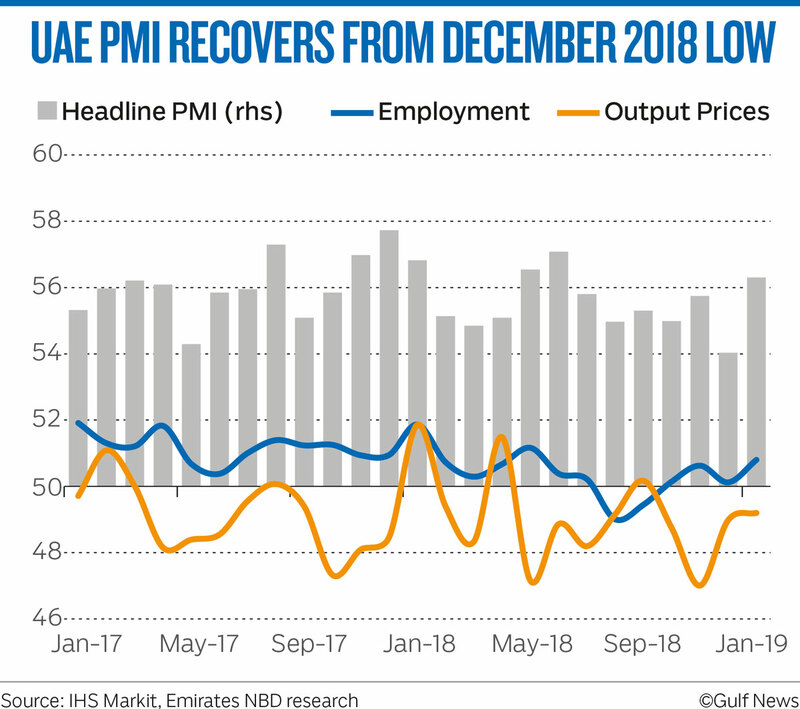 Dubai: The Emirates NBD Purchasing Managers’ Index (PMI) for the UAE rebounded to 56.3 at the start of 2019, after a disappointing December reading of 54. The January PMI was the highest reading in seven months and signalled a good start to the year for the non-oil private sector. “The main driver for the higher headline index in January was faster output growth, and the new orders index rose as well. The improvement in business activity was partly due to promotions and price discounting by firms,” said Khatija Haque, Head of MENA Research at Emirates NBD. The output price index remained below the neutral 50-level in January, signalling another month of lower average selling prices in the UAE, although the extent of price discounting in January was slight. Selling prices have declined for eight of the last nine months. Input costs rose only modestly in January. Data showed fewer than 3 per cent of firms reported increased hiring in January, despite the rebound in output and new order volumes. Some firms indicated that efforts to cut costs prevented them hiring. These efforts were generally successful as staff costs rose only marginally again at the start of 2019. Purchase prices also increased at a relatively modest pace. Output prices, meanwhile, decreased for the eighth time in the past nine months. Survey panellists reported having offered discounts to customers in order to help stimulate sales amid competitive market conditions. The improving demand picture is expected by firms to continue during 2019, with this alongside marketing activities set to help lead to increases in output. Business optimism about future output remained high in January, with more than 68 per cent of firms expecting their output to be higher in a year’s time. None of the firms surveyed expected output to be lower in a year’s time.